Nuclear medicine, or scintigraphy, in the horse is predominantly instituted to aid in locating the region of pain attributing to lameness. It provides a two-dimensional image which reflects the relative localization of a radioactive substance that binds to regions of bone which are physiologically active/turning over. There are numerous regions where increased uptake or binding is expected – where bone turnover is increased such as the growth plates of the immature horse, or the palmar condyles of the galloping race horse; however regions where there is deemed to be a disproportionate amount of radioactive binding or uptake (hot spots) compared to the opposite limb, or expected normal, may indicate that bone pathology exists which could account for the lameness or poor performance. Nuclear medicine is extremely sensitive in detecting areas of bone activity however the poor spatial resolution of the image usually then indicates that further work up such as nerve blocks or diagnostic imaging (radiographs and/or ultrasound) are required to determine the significance of such hot spots. The basic principal of nuclear scintigraphy is the detection of gamma rays emitted from the decay of a radionuclide injected intravenously into the patient with a Gamma camera (Scintigraphy Machine). The radionuclide, or radioisotope, used at Ascot Equine Veterinarians for the musculoskeletal imaging is technetium [Tc-99M]. Technetium has a six-hour half to facilitate early decay of radioactivity. Methylene diphosphonate, also known as MDP, is the most commonly used attached pharmaceutical in the equine. MDP is localized in bone based on the osteoblastic activity or remodeling in bone and therefore is an excellent, extremely sensitive, physiologic marker of bone disease (stress fractures, remodeling at ligament and tendon attachment, remodeling at sites of bone trauma, and bone cyst formation etc). Bone that is stressed or remodeling due to an injury that affects the metabolism of bone will absorb a disproportiate amount of the radiopharmaceutical compared to the opposite limb or expected “normal” for that site. This will then appear as an area of increased radiopharmaceutical uptake, or a “hot spot”, on the gamma camera. Although the spatial resolution is poor compared to MRI or CT, the sensitivity is remarkable. Any area of uptake represents a physiologic change in bone that may need further evaluation – this may indicate nerve blocks or further imaging in the form of radiographs or ultrasound to validate the relative significance of such hot spots. Prior to administration of the radionuclide, the horse is rugged and has floating boots applied to the limbs to maintain warmth and blood flow to the extremities. The patient is then administered the isotope intravenously through an indwelling catheter. The dose is very safe. Occasionally, a pool phase, or “vascular phase” may be obtained of a specific area of interest which will indicate the amount of blood flow to the target area. Pool phase images are obtained immediately following injection. Approximately 3 hours post injection, bone phase images are acquired. 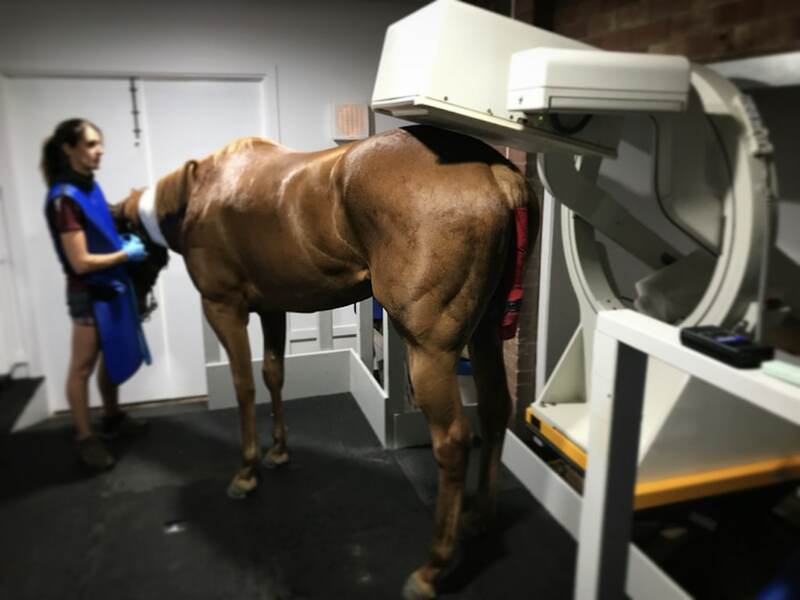 At Ascot Equine Vets, we can scan the front half, back half, entire horse, or spine. An extremely important aspect of scintigraphy is the post-evaluation lameness exam. The multiple areas of increased radiopharmaceutical uptake are evaluated clinically to determine their individual importance to the overall presentation. A plan for further diagnostic procedures or management is then determined.